Few will understand the crazy dynamic that is life with 2 kids under the age of 2. You’re on constant high alert, and mommy mode is on another level. If you have 3 under 3 or 4 under 4 I am saying a little prayer for you right now, life is crazy but you got this. Let’s not forget that you have to have your all mighty diaper bag, ready for anything. It goes everywhere with you and the kids, sometimes taking up a much-needed resource. Our hands. I know mamas can relate to the value of a free hand. I talked about a terrifying moment when I needed an extra hand with my toddler in my diaper bag review. When life gets inevitably hectic, I’ve put this diaper bag checklist together for you to get organized for your newborn and toddler. It’s helped me keep my sanity while running out of the house with these two. 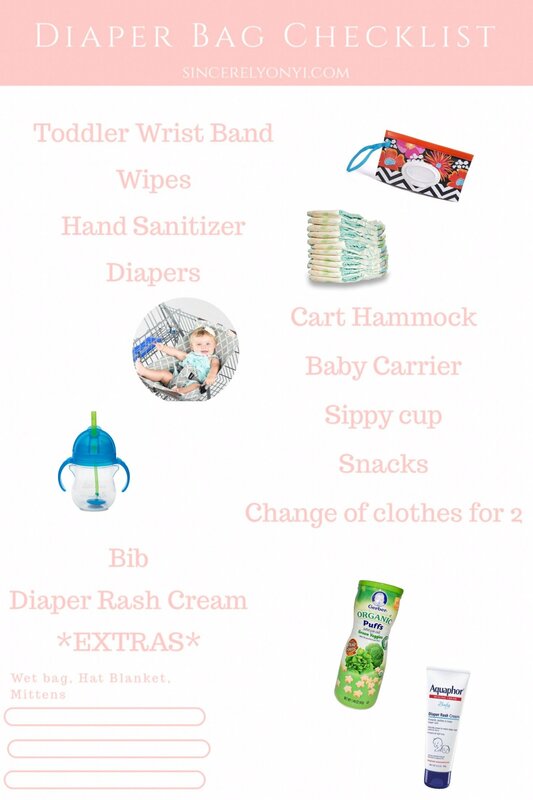 If you want to go straight to the printable checklist CLICK HERE or scroll to find out what I love having in my diaper bag and why. I know all Mamas and Daddies can relate to the value of a free hand. The Laguna Tide Diaper Bag along with the Toddler wristband have saved my sanity. One of the terrifying moments of my life is when he stood in front of the garage, looked across the driveway and started running full speed into the street. Thank God I caught up with him in time, but I was so shaken I had to call my husband in tears. The Laguna Tide Travel Diaper Bag is perfect for our 2 under 2 needs. Instead of having to juggle a bag over my shoulder while reaching for my toddler and holding my newborn, the Backpack allows me to have 2 hands completely free. 2 separate, large compartments; perfect for all our diaper bag essentials. Use code ONYIGP15 to get 15% off when buying from Amazon. Ironically, my toddler loves to wear this wristband. When I bring it out he whips out his hand and never wants to take it off. You do want to be mindful of maintaining enough slack so that your toddler doesn’t get pulled down. I’m not speaking from experience *jk, I am. But he was fine, I promise* Grab one of these here. Of course, wipes are a must to keep stock of. Wet and poopy diapers, last minute clean up; however, I don’t recommend using them for wiping runny noses since they can actually irritate the skin with repetitive use. Every time I have gone shopping with both little ones or just the baby, I’ve been so relieved to rely on my Binxy Baby. More than 24,ooo kids a year are seen in the ER for shopping cart accidents. That is a big scary number, but what’s most alarming is parents not knowing that car seats cannot safely rest on top of a shopping cart, not until Binxy Baby. Now I can lay my little one straight into the hammock or keep him in his car seat and strap that into the Binxy hammock. It allows for ample space in the cart while keeping my precious cargo safe just above it all. It is compact enough to store in your diaper bag which is perfect for on the go. You can get 10% off your Binxy Baby products with my link here. For that moment water and soap aren’t close by but you need peace of mind that germs aren’t being passed around. Don’t feel bad about forgetting to refill your diapers. I learned this lesson by experience and have finally learned by the 2nd child that you can never have too many diapers in the diaper bag. I can’t say enough, that being as hands-free as possible is a must when you have two young ones.My Lille Baby Carrier not only looks good but is the most complete version of a baby carrier that I’ve used. Although I prefer a cloth carrier for the newborn stages like the Baby K’tan, the Lillie Baby complete is a more versatile version for newborn through toddler stage. It comes with an optional lumbar support which is a plus when you decide to carry your heavier toddler. You can get $10 off your Lillie Baby Carrier with my link Here. My favorite sippy cups are these weighted flexi straw cups. Out of the several sippy cups we’ve tried, these don’t leak, are actually bite proof and can have him turn it in any direction and still get to the fluid.